Home | Can Transparency Bring About Change? Can Transparency Bring About Change? Three recent reports have highlighted the role of transparency in improving our food and agriculture system. 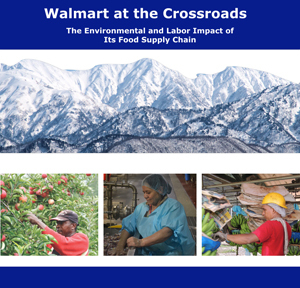 Last week, Food Chain Workers Alliance (of which Fair World Project is a member) released a new report on problems in Wal-Mart’s supply chain. The report finds that Wal-Mart’s suppliers consistently fail to meet Wal-Mart’s own code of ethics for suppliers, with no real consequences. Beyond those basic lapses, co-director Jose Oliva explains, Wal-Mart is not transparent about adherence to the code. That means there is no way to verify their claims or ensure farmers and workers in the supply chain are treated fairly. On the other end of the spectrum in terms of ethical reputation, the Atlantic reported last week that Patagonia is attempting to address serious labor problems in their supply chain. Patagonia has its own supplier code, but in contrast to Wal-Mart, Patagonia wants to be transparent about where there are problems. Patagonia is inviting other brands to address problems with them and adjusting their expectations for suppliers. COO Doug Freeman tells the Atlantic that he also believes consumers will appreciate the transparency as they work to address these problems. Wal-Mart’s troubling record and the tremendous labor issues in the apparel sector are big problems and millions of workers and farmers are affected by our collective inability to create significant change to date. It remains to be seen whether transparency is the key to transformation that Poynton argues it is, but it is certainly a good step in the right direction and Patagonia should be applauded for taking it and Wal-Mart must be pushed to be transparent immediately.